Pan Am Flight 103 was 31,000 feet in the air, heading for New York City, when it exploded over Scotland on the longest night of the year, December 21, 1988, killing 259 people on board and 11 people on the ground below. It was the world’s deadliest act of air terrorism until the September 11, 2001, attacks on New York and Washington, according to the FBI. American and British investigators painstakingly pieced together the aircraft’s wreckage and found it had been destroyed by a bomb, which they accused Abdelbaset Ali Mohmed al-Megrahi and another man of planting. 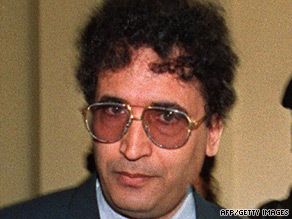 Al-Megrahi, once the security chief for Libyan Arab Airlines, and Al-Amin Khalifa Fahima were Libyan intelligence agents, the U.S. and Britain alleged in a November 1991 indictment on 270 counts of murder and conspiracy to murder. The indictment set off a battle that lasted more than seven years. Libya at first refused to hand the men over, prompting the U.N. Security Council in April 1992 to slap sanctions on the north African country, clamping down on arms sales and air travel. The Federal Bureau of Investigation put the men on its 10 Most Wanted Fugitives list — the only time officers of a foreign government have ever been named on the list, as far as the FBI knows, spokesman Ken Hoffman said.